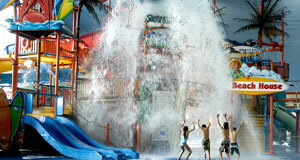 Splash the day away at the directly connected Fallsview Indoor Waterpark! 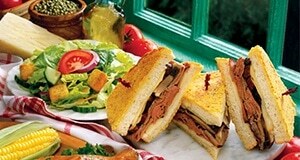 Guests of the Skyline Hotel & Waterpark can enjoy Kids Eat Free at Perkins Family Restaurant & Bakery. 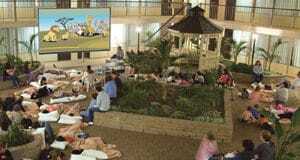 Treat the kids to popcorn and a movie in the courtyard each night starting at 8:00pm! The AAA/CAA rated 3-Diamond, 3 star Niagara Falls Hotel is located in the middle of Falls Avenue Resort at the front steps of Casino Niagara and a two minute walk to the Niagara Falls and Clifton Hill. The Skyline Hotel & Waterpark has long been a family favourite, and features a climate controlled indoor skywalk to the 3 acre Fallsview Indoor Waterpark in Niagara Falls. The Skyline Hotel & Waterpark offers a variety of hotel guestrooms, from Traditional with two queen beds, to family suites offering three queen size beds to accommodate up to six guests of any ages. The Skyline Hotel & Waterpark Niagara Falls also features a selection of hotel packages that will enhance a getaway to Niagara Falls. From a Waterpark Getaway Package, Two Night Hotel Package, or a Casino Niagara Hotel Package – the Skyline Hotel has something for everyone. Plan a Niagara Falls getaway this Spring and enjoy our Hotel Waterpark Package with accommodations, 4 waterpark passes and our Fallsview Kids Eat Free offer at the Fallsview Restaurant. The Skyline Hotel & Waterpark, Niagara Falls, offers guests a direct connection to Falls Avenue Attractions, and long standing partnerships with many Niagara Falls Hotels, and Niagara Restaurants all centrally located in the Niagara Falls’ tourist district. Enter for your chance to win a to a family waterpark vacation for four or a romantic retreat for two!